Due to inclement weather, rehearsal is cancelled for Wednesday, February 27. Hopefully we'll see you next week! Check out this poster and look to our Facebook page for daily updates starting Saturday, February 2. Go to www.facebook.com/NorthMetroChorus/ to see our daily updates! Following our international win in October 2017, our "new" Master Director 700, Erin Howden, was asked to do an interview with FloVoice. FloVoice is a vocal music channel that focuses on a cappella singing, including barbershop choruses. Watch and enjoy Erin in her four-part interview! (Toronto’s) North Metro Chorus Wins Gold at International Competition!!! The North Metro Chorus from Toronto competed in the Sweet Adelines International Competition in Las Vegas, Nevada last week, placing first overall, becoming the 2018 International Champions. Thirty-three choruses from several countries were involved including Australia, Canada, the United States, New Zealand, Scotland and Sweden. North Metro is one of the largest Sweet Adelines International choruses in the world, made up of 140 women who hail from all over Ontario. The chorus has had several breakthroughs during their illustrious history, including the first chorus outside of the U.S. to win “gold” and the first chorus to present character-driven “packages” at the international level that tell a story in song and dance. Their most well-known are Newsies, Toy Soldier, Anchors Aweigh, Mary Poppins, Oliver, the Irish set, and Paint Your Wagon. Certified Director Erin Howden, a renowned choreographer with the organization, led the chorus to their gold medal win through two competitions. In the first round semi-finals on Thursday, North Metro performed two songs against 32 other choruses who each qualified to compete by being top scorers in their own region. North Metro was Region 16’s highest scoring chorus, (an area which comprises choruses from Ontario and New York State). North Metro qualified from their semi-final performance with one of the top ten highest scores, thereby putting them into the final competition. On Saturday, each top ten chorus presented a performance package of up to 15 minutes in length. North Metro emerged with the highest score, winning their gold medal. Choruses are judged by 8 judges in 4 different categories including Sound, Music, Expression and Showmanship. Amazingly, this was Howden’s first international competition as director, having taken over from her mother, esteemed Master Director June Dale last year when Dale injured her leg and was unable to direct. Howden upset other choruses in this division who are long-time gold medalists. There were 120 members on stage, each participant singing in one of four parts, tenor, lead baritone or bass. Previously under the direction of June Dale, North Metro was gold medal champions for the years 2013, 2003, 2000, 1997. Also happening during the week in Las Vegas were other competitions including the quartet competition and Harmony Classic Division A and AA for smaller choruses. North Metro’s own quartet Spritzer, with 3 of their members in our chorus, won fourth place in the Quartet contest. North Metro will be competing in Las Vegas the week of October 9 - 14. If you can't be there, check us out via the webcast: http://www.sweetadswebcast.com/. Sweet Adelines Intenational offers this for free, but donations are gratefully accepted. Have a webcast party! Challenge your friends and family! We would love to have you all watch. Cheer wildly for Erin Howden, first time directing at International! Cheer on Spritzer! Cheer on all the Region 16 competitors, we are going to be a mighty force! Spreading the harmony! North Metro is excited to be preparing for another International Competition this year in Las Vegas. We are also thrilled to say that Erin Howden has been appointed to the position of Director of North Metro Chorus in addition to continuing to share her creativity as Choreographer. June Dale, who has been directing us for the past 45 years, has left a lasting legacy and has now handed the baton to her daughter. Erin has already taken us to regional competition but will be stepping onto the International stage as Director for the first time this fall. Erin is well known within the Sweet Adeline organization as a member of the International Faculty and is actively involved in coaching, educating and motivating performers worldwide and we are very excited to welcome her to the International stage as our new Director. We look forward to seeing you all in Las Vegas and send good wishes to all competitors. No one sets out to be a leader but becomes one by the quality of their actions and the integrity of their intent. 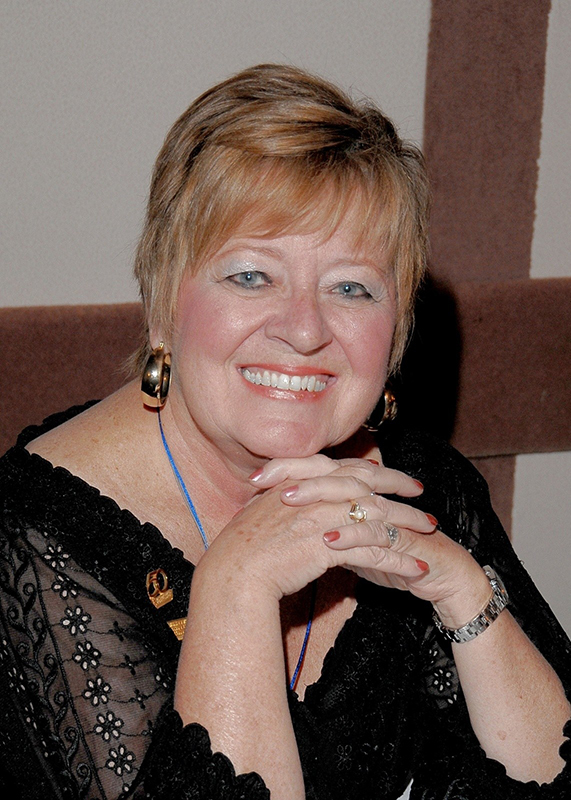 As a member of Sweet Adelines for more than 56 years, June Dale has demonstrated that she truly is a leader. When June agreed to direct the 17-member North Metro Chorus 46 years ago, it was realized right from the beginning how very blessed our chorus was to have this creative Director with her tremendous talent, patience, enthusiasm and creativity who always ensured that all our performances would be done with class and professionalism. Since then, North Metro has grown to over 140 members and has won every Regional competition we have competed in during the past 46 years. The chorus has placed in the top three Internationally for the past twenty-one years, and we are very proud to be four-time gold medalists. We have June to thank for our success. With June’s vision and innovative approach to barbershop, she sought out to break new grounds through character and theme performances such as Newsies, Sailor and Mary Poppins. June is recognized and highly regarded both in the Regional and the International Sweet Adeline organization. She has been a member of the International Faculty, is a Certified Arranger and has been an International fourth place quartet medalist. Under June’s direction, North Metro was the very first chorus to break the 700 score at the regional level earning June the title of Master Director 700. Unfortunately, more than a year ago, June had a very serious fall and broke her leg badly. As a result, following extensive surgeries, June has endured many months of pain and difficult rehabilitation, but is finally on the road to recovery. However, after more than 46 years as the Director of North Metro Chorus, June has made a decision to step down from competitive directing which is a very enormous emotional decision for her and for all of the chorus. Fortunately, she is not leaving the Sweet Adeline world altogether. Her passion for music and for the chorus will continue in non-competitive venues, such as directing the chorus in shows and sharing her arranging and coaching skills. One of June’s biggest accomplishments has been her influence on members of her own family which has resulted in another wonderful asset to the organization. We are very excited to say that her daughter, Erin Howden, already well known within the Sweet Adeline organization, has stepped into the Director position in addition to continuing to share her creativity as Choreographer of North Metro. She will be directing us in the upcoming International Competition in Las Vegas following our qualification at the last regional which was also under Erin’s direction. North Metro will be forever grateful to June for sharing her amazing journey with us as an incredible Director and wonderful friend. We love you! Your legacy will live on! Congratulations to Julie Orchard for winning the Region 16 Assistant Director Award for 2016! Well deserved! Save the Date! Saturday, September 16, 2017. Global Kingdom Ministries (401 & Markham Rd, Scarborough, Ont). Congratulations to Lynn Reisch, our Costume Designer/Visual Coordinator, for winning the 2016 "Barbie" Award for the design of North Metro's toy soldier costume worn for our Denver international winning package! Check out our Denver finals package!